Frayed details are everywhere this season. Why not have them on a cute dress as well! 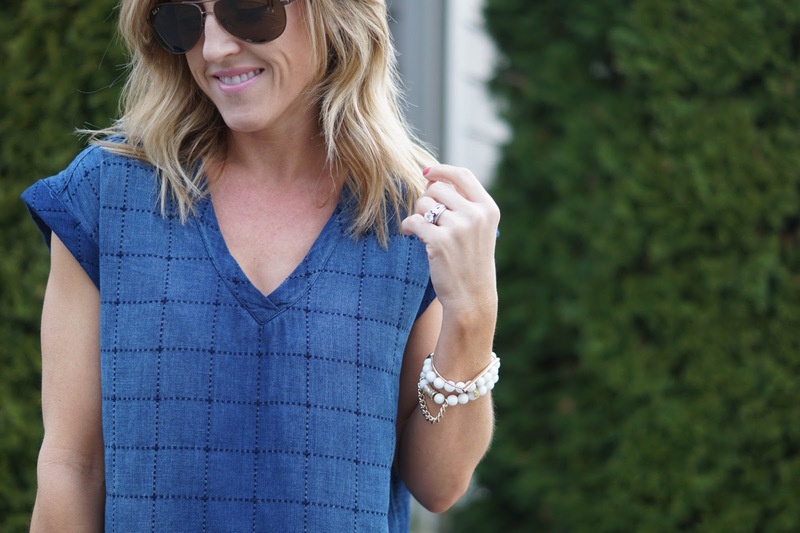 This tunic dress is crazy good! Easy to wear, subtle plaid detail, a hi-lo hem, and of course, a frayed hem. It is also available in a pretty light grey color. I'm all about easy to wear, comfortable dresses. Let's be real - by the end of the day I don't want to be sucking it all in. I've styled it here a little more dressy for work, dinner, church, happy hour, etc. However, I was playing dress-up the other day and trying on some new Spring pieces I bought, and love how this dress looked with my sneakers! Ha! Yes! I hear ya! Definitely have to be comfortable.